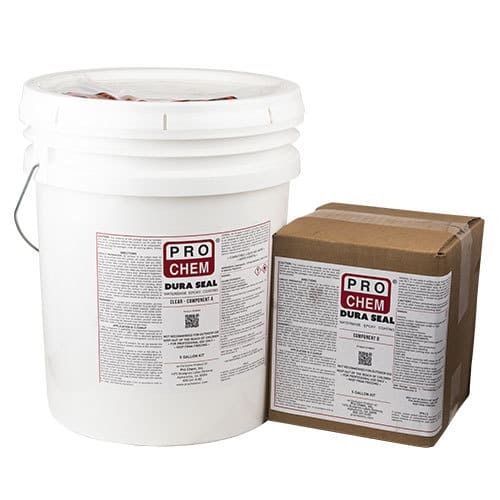 DURA SEAL | Pro Chem, Inc.
DURA SEAL is a water-based, premeasured, two-part pigmented epoxy coating formulated to provide a tough concrete seal that protects against chemical penetration (including brake fluid) and the physical deterioration of existing concrete. Dries in 12-24 hours for traffic, with maximum hardness in 5-7 days (dependent upon temperature – higher temperatures will cause faster dry time). 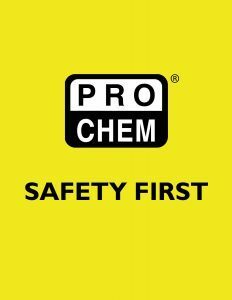 Regular maintenance and cleanup is simple by using any Pro Chem water-based degreaser. Its low odor makes it an ideal product to use in facilities such as hospitals, schools and nursing homes where the presence of solvent odors and/or flammability problems would normally prohibit the application of a sealer. May be applied to new concrete. Follow surface preparation instructions to ensure the floor is prepared to accept coating. Mix all of Part B (Resin) into Part A (pigmented hardener) using an electric drill mounted with a “Jiffy” type mixer. Mix until a uniform color is obtained. Avoid air entrapment. Let sit 3-5 minutes after stirring to dissipate air bubbles. Pot life after mixing is 90 minutes. DO NOT USE BEYOND THIS TIME FRAME EVEN IF PRODUCT APPEARS NORMAL. Apply mixed product in thin even coats with a short nap 3/8” or no nap paint roller from a clean roller pan. Do not pour directly onto floor. There is no need to work this finish into the surface since the superior penetrating qualities of the product will perform this function. Discard roller cover when through. All remaining application equipment may be cleaned with soap and water before pot-life expires. Discard all unused material after 90 minutes. No noticeable change will be noted but film characteristics will be unsatisfactory. Two coats are recommended (wait 3-6 hours between coats). *New concrete surfaces should age at least 30 days before being coated. NOTE: DO NOT apply if floor temperature is below 60°F or over 90°F or if relative humidity is above 80%, or if air temperature is below 60°F within 24 hours of application. Not recommended for outside use. DURA SEAL does not contain UV protectant and may turn chalky or cloudy in prolonged direct sunlight.